Aki Sasamoto, Sunny in the Furnace, 2014. Performance view, The Kitchen, New York, March 2014. Aki Sasamoto (center) and Jessica Weinstein (right). Photo: Julieta Cervantes. PERFORMANCE IS A CRAFT and not a right, as some artists and related others would have audiences think. Artist/performer Aki Sasamoto, however, is a rare example of someone for whom performance is both craft and right, and her latest show, Sunny in the Furnace, is yet more proof of her uncommon expertise over this slippery medium. Together with her equally accomplished collaborators—composer/musician John Bollinger, performer Jessica Weinstein, sculptor Sam Ekwurtzel, and mathematics professor, Pau Atela—Sasamoto fuses theater, sculpture, storytelling, moving image, mark-making, and music into a mournful meditation of sorts on life and how to endure it. For all of the sorrow at its center, the show is full of humor and delight. Though not flawless, it’s as impressive for its quiet achievements as it is for the possibilities it proposes as to what and how a performance can be. Sunny/yesterday my life was filled with rain/Sunny/you smiled at me and really eased the pain/now the dark days are gone/the bright days are here/my Sunny one shines so sincere and/Sunny one so true/I love you. How, Sasamoto wonders, after such terrible loss could Hebb think up Sunny? She explains that she Google-searched for the answer, and paraphrases the songwriter’s explanation for us: “All of my intentions were to look for happier times.” Sasamoto thereafter informs us that her friend Tsuyoshi committed suicide years ago while she was studying abroad. (“Aki betrayed us,” were reportedly some of his last thoughts of her.) Whether or not the story is true, the why of this death launches Sasamoto into a pseudo-scientific lecture of her own on “the elasticity of people,” on lightness and darkness, intelligence and dumbness, and how to strike a balance between these states in order to stay alive. “Work on your idiocy,” she concludes. That is, if you care to survive. Part anecdote, part parable, stories such as this anchor and propel Sasamoto’s show. In a voice that hits a buzzing frequency somewhere between a honeybee and a fury, she speaks of her admiration for Mike Tyson’s “amazing dumbness,” and for Arnold Schwarzenegger’s belief that pumping iron saved his life. She recalls a scientific study involving monkeys that tested perceptions of what is fixed and what is transient, what is believed to be possible and/or impossible. She diagnoses and diagrams two diseases that are known to create art: “charismatic syndrome” and “strategy.” (She also offers up the possible cures). Forces and their counterforces—actions and their equal but opposite reactions—provide the underlying physics of Sunny in the Furnace, which never settles into a dull equilibrium. Like theater artist Richard Foreman before her, Sasamoto’s stage in many ways places the space of the mind on view. Full of contraptions and distractions and Sisyphean labors, her titular “furnace” forges the thoughts and feelings that give meaning to the same actions and objects that fuel it. (Quite simply, stuff is as stuff does). Like Foreman as well as sculptor Fred Sandback, she also conducts space and lines in string. Red bungee cords swing in from the sides and are secured to footprints cast in cement; they’re later plucked like harp strings to punctuate Bollinger’s music and rhythms. Screens descend from the ceiling; clip lights are rolled along the floor; words are mopped in water on the back wall and the floor only to evaporate under the heat of the lights. A stilt walker (Weinstein) brings in set pieces; oversized wood sculptures by Ekwurtzel double as props; a writing desk becomes an obstacle to movement as it provides a surface on which to write. The flurry of seemingly senseless activity—Sasamoto violently flipping and writhing on the floor like a fish out of water, or skating awkwardly in cement boots on wheels—is at once hilarious and harrowing. All the various parts that make up Sunny in the Furnace cohere, but never coalesce. The whole stays piecey. Questions, pointedly rhetorical, hover unresolved. The work ends, but feels unfinished—and that is how it should be. Tragedies—suicide, hijacking, catastrophe—are events that by their nature suspend narrative structure. Grief too, by its nature, evacuates the gravities of beginnings, middles, and ends. Untethered in the wake of these experiences, we reassert ourselves in time, into time, to repurpose the shards. In Sasamoto’s beautiful, tangled world, sense is what we’re left to make of it all. 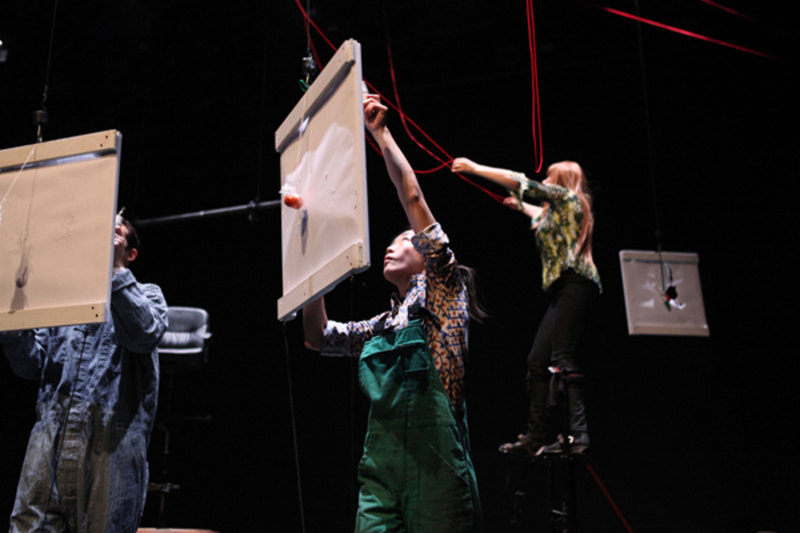 Aki Sasamoto’s Sunny in the Furnace ran from March 6th to the 8th at The Kitchen in New York.